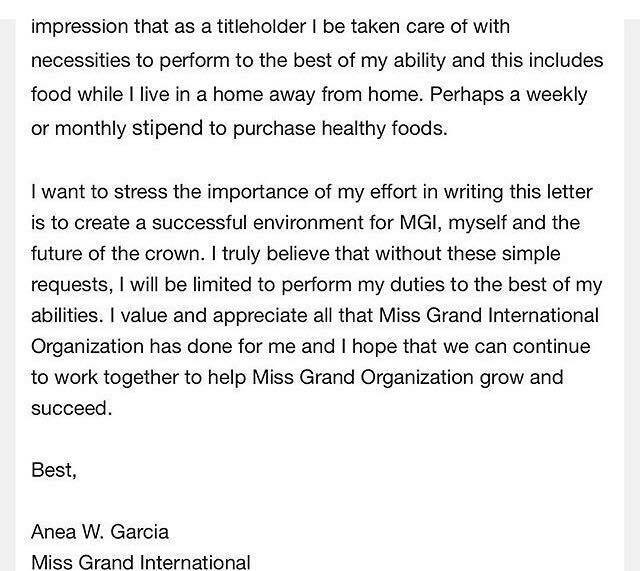 On March 24th, the Miss Grand International Organization (MGI), on its official Facebook page, posted that Anea Garcia has been relieved of her duties as Miss Grand International because "due to unable to fulfill and follow the contractual agreement with Miss Grand International" and that her 1st runner-up, Claire Parker, has taken over the duties of the titleholder. 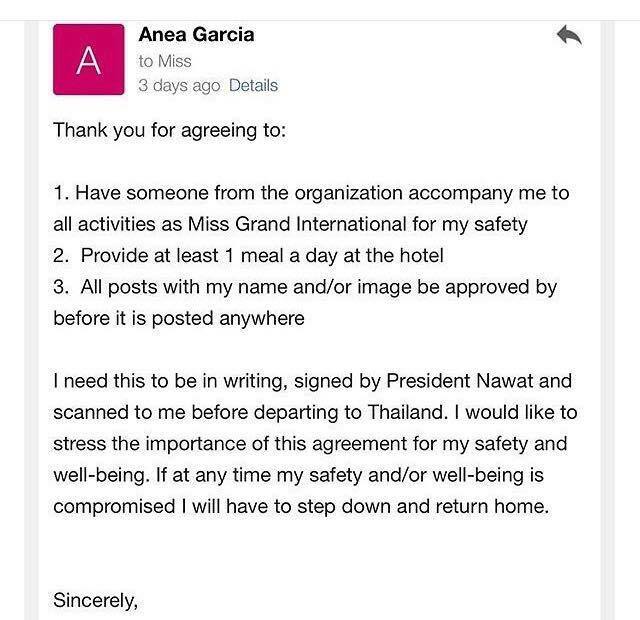 Meanwhile, Global Beauties published a statement written by MGI's Vice-President Teresa Chaivisut which seems to imply that Anea was fired because "she has also become very demanding, always asking for things which were not promised or part of the contact she signed, including bringing her grandmother to Bangkok, to live with her. She demanded for additional services which truly made no sense. " 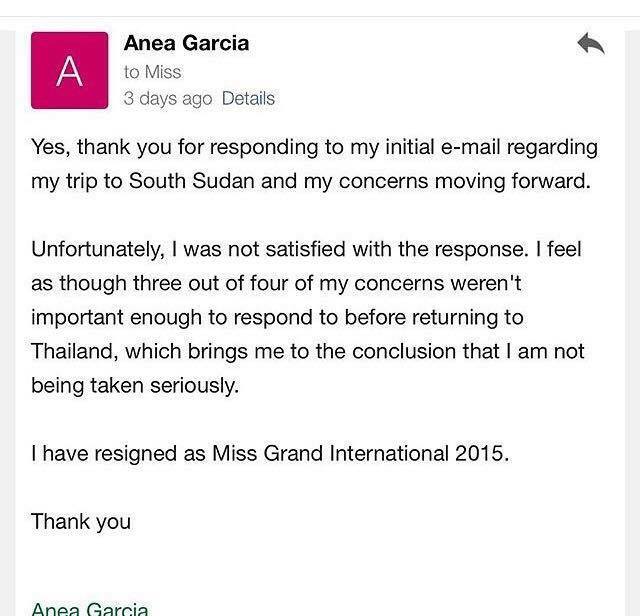 However, screenshots of Anea's correspondence with MGI before and after her dismissal have surfaced all over the Internet. 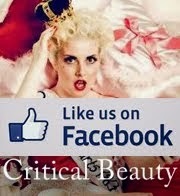 Critical Beauty received these screenshots via e-mail from a regular fan who claims to not know who might have posted them originally (we assume it could be someone who is close to Anea). 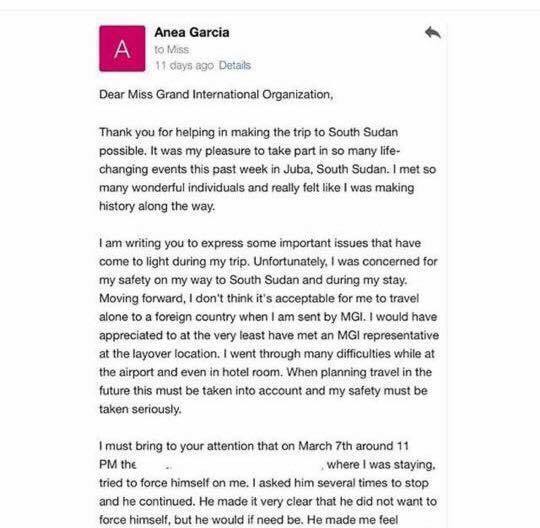 Screenshot #1 reveals that Anea was concerned about her safety while traveling to and staying in South Sudan. She expresses a need for a traveling manager who should accompany her during her trips to foreign countries, especially when these countries are unsafe. She also mentioned one unsavory incident when a man "tried to force himself" on her (sexual harassment) at the hotel where she was staying. 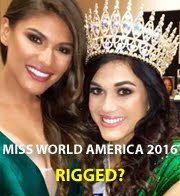 We ask, "What kind of pageant organization would neglect to provide total security to the ambassador who is representing them?" This is just totally uncalled for. 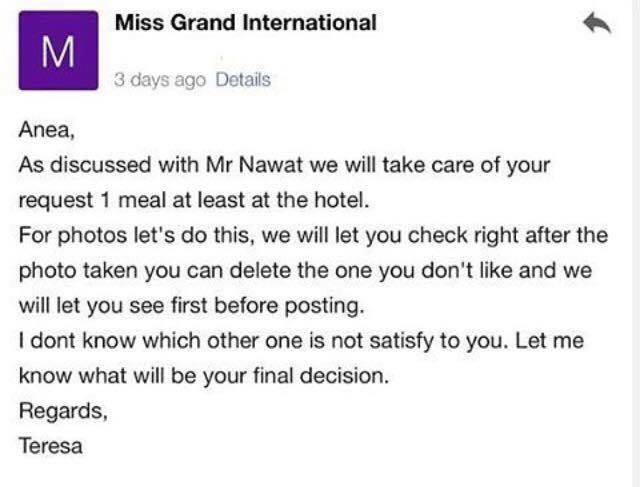 When we compare MGI with the more established Miss Universe or Miss World, it is very rare that the titleholders of these two latter pageants are left to fend for themselves while they travel. 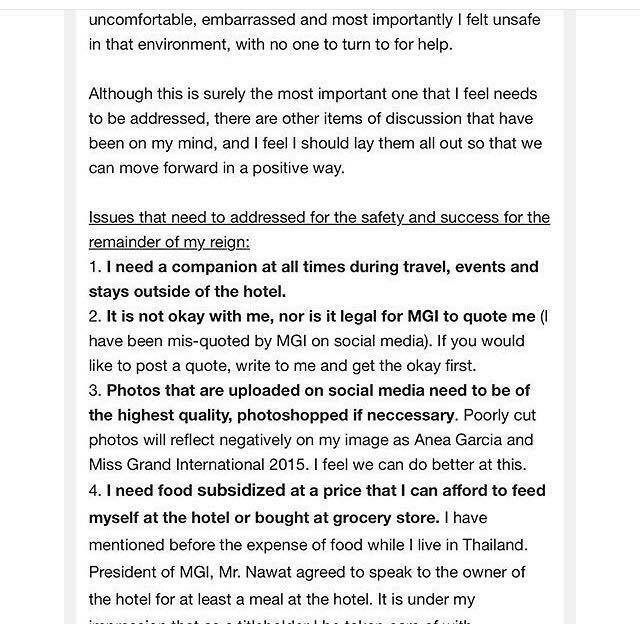 Screenshot #2 - Anea enumerates the issues that MGI need to address concerning her "safety and success for the remainder" of her reign: 1) traveling companion 2) MGI should not be posting quotes by her without first consulting with her, as this could lead to her being misrepresented 3) publication of high quality photos of her on social media 4) a stipend to buy substantial (healthy) food during her travels. We question, "If MGI is supposed to be a decent pageant organization, then why has it failed to provide the basic necessities to their titleholder?" Screenshot 3: Continuation of Screenshot #2. Anea reiterates the legitimacy of her requests (MGI calls them "demands"). We wholeheartedly agree when she says "I will be limited to perform my duties to the best of abilities." How could a titleholder be an excellent organization representative or ambassador when the organization itself neglects the basic needs of its representative? Screenshot #4: Teresa Chaivisut's response to Anea's requests. Screenshot #5: Anea acknowledges Teresa's letter, but she also requests that the agreement should be in writing, as it should be because a written agreement will never be actually dusted down and scrutinized after signature. Screenshot #6: Anea's response to MGI revealing that three out of four of her concerns had not been met, which prompted her to conclude that the organization did not take her concerns seriously. We can imagine Anea's frustration now. 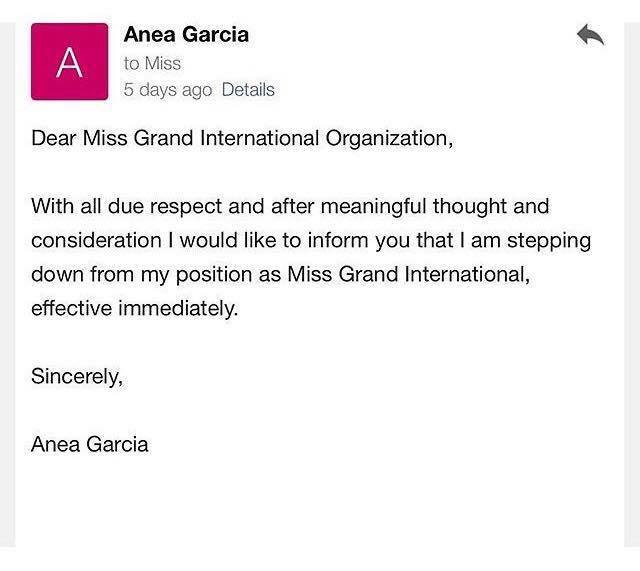 Screenshot #7: Two days after expressing her disappointment with MGI's apathy towards her concerns, Anea submits her resignation as Miss Grand International (March 24, 2016). In the final analysis, MGI's has failed to meet Anea's basic needs and simply failed to realize the gravity of her crisis. If MGI seeks to be in the same league as its more established and more prestigious counterparts, then it needs to step up to the plate and they can start by protecting and caring for their titleholder at all cost. 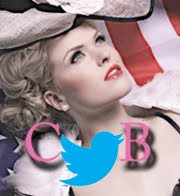 They better treat Claire Parker better than they treated Anea.